Downtown Muskegon Development has put out a "request for proposals" in an attempt to lure a developer to purchase the building. Officials say getting a high selling price is not as important as finding a willing, well-financed and competent developer. Sometimes I wonder if they look outside their window. I don't have a problem with the article, just the headline. The Hackley Bank building isn't even the tallest building on Western Ave. the Holiday Inn is a story taller. It certainly isn't the downtown's "lone" skyscraper. Bayview Towers, Hartford Terrace, Jefferson Towers, Huntington Bank, the Holiday Inn, and the Shoreline Inn and Suites are all taller than the Hackley Bank building. A couple weeks ago there was a Chronicle article about the redevelopment of downtown. There was one line that mentioned there was a party interested in this building. I was talking to a downtown business owner today and he told me that he heard it was a done deal. I don't know if that's really true or if it's just a rumor. I know there has been interest in that building from several different parties over the years and so far no one has been willing to tackle it, but whether it's true or just a rumor I find it very encouraging that people are showing interest. 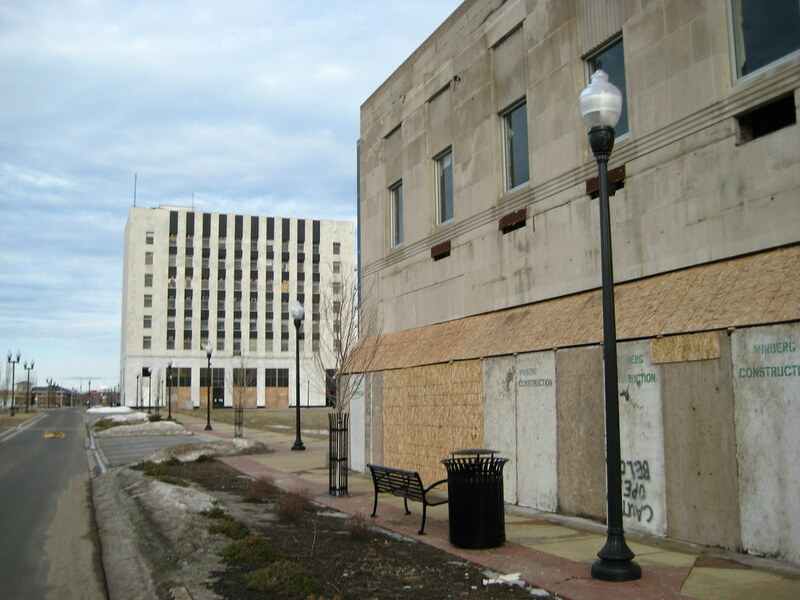 Out of all the empty buildings downtown I think for me this would be the saddest one to lose, it was built at a time when there was great optimism in Muskegon and it's endured nearly a centery of change. I can only hope this current optimism in Muskegon leads to the restoration of this building. It's true. The developer is out of Grand Rapids and has a very good reputation. My understanding is he proposes retail on the first floor and residential above. They should be closing in the next few weeks. Of course, things happen and it could all fall through. We'll have to wait and see. That is awesome news! That means in the time-span of about one year we've gone from none of the buildings sold on the mall site to all of them! I really think residential is the best use for this building at the time since there is more than enough empty office space downtown. I wonder if he is planning apartments or condos? I look forward to reading about this in the Chronicle. Well the news is official now, and it's even better than I hoped for! 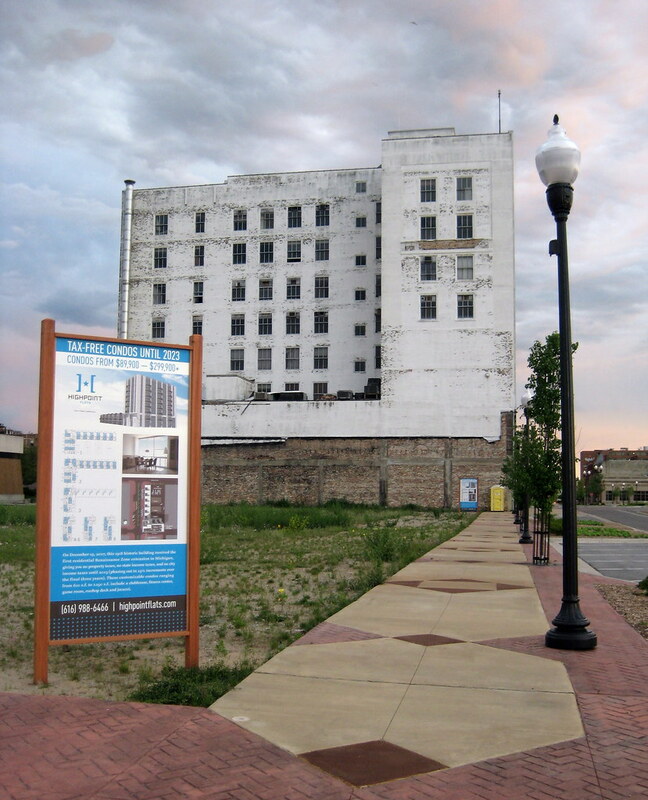 Jonathan Rooks and his Parkland Properties of West Michigan have a purchase agreement to buy the 10-story former bank building and two vacant lots in the heart of downtown Muskegon's redeveloping "city center." 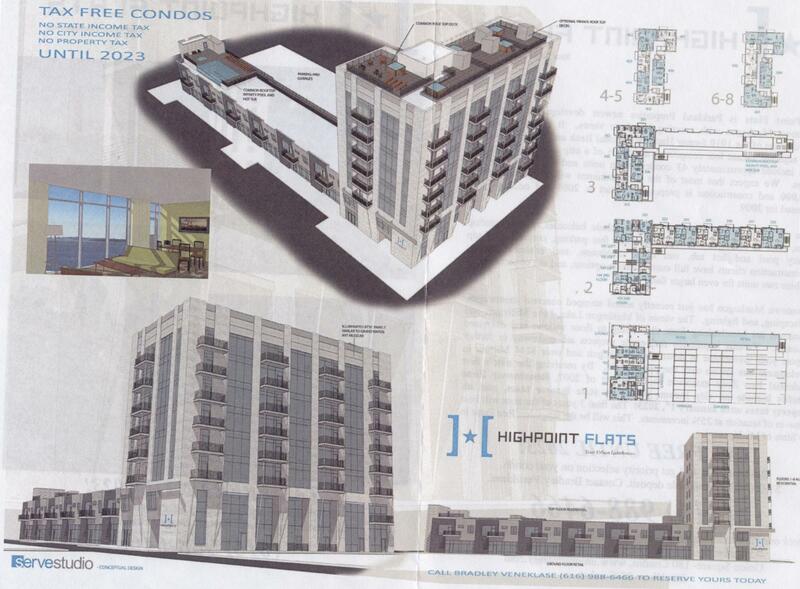 Rooks told The Muskegon Chronicle he has plans for 36 condominium units and associated commercial space in the bank tower, which includes new construction planned east along West Western Avenue. Rooks said he anticipates completing the property purchase in the coming weeks with construction planned for 2008 and occupancy in 2009. The two lots east of the Comerica tower are also part of the Parkland deal. Rooks said his company plans to have three-story buildings along West Western Avenue to Jefferson Street. The lower floor would be commercial and the two upper floors another 12 residential condominiums. All of the condos should be priced under $200,000. I think the Bank will go first and then the new construction. Hopefully we'll see work begin sooner, rather than later, but pre-sales are probably the deterimining factor. That's amazing that not only does he plan to redevelop the bank building but also build two more buildings along Western Avenue. With this anouncement probably 50% of Western Avenue is under redevelopment or planned redevelopment! The Chronicle article does seem to make a mistake where is says there will be 36 condominium units in the bank tower. If you read through the article it seems to be saying there will be 24 in the tower and another 12 in the new buildings. Another thing not mentioned in the article is financing. Usually banks won't finance a project unless 50% of the space has been sold or leased so that would mean 18 of the condos need to be sold and some of the commercial space before the project can move forward. Unless he plans on doing this is phases in which case only 12 of the units in the Comerica bank building have to be sold for work to begin. I am really excited about this developer because one of his projects is directly across the street from my office. In fact it's right out my window and it is was done very well. There are many unit types in the building but studios started at $80,000 and almost all units were under $200,000 which is very cheap in the condo market. Another article that mentions the project. Not much new information. It mostly talks about how awesome the new section of Western Avenue looks. It does say that there will probably be a 7 year extionsion on the Renaissance Zone for this project. One thing that gets me about the article is that it says the former Comerica building is 7 stories tall, while Sundays article says the building is 10 stories tall. Last time I was in Muskegon the building was 8 stories tall. Watch out, Muskegonites. This developer does *not* have a good reputation in Grand Rapids. He basically can't do any more work in GR because the contractors won't work with him. He has a lot of ticked off residents in several of his projects. BE VERY CAREFUL when dealing with him. How has he "ticked off" residents in his projects? There is a whole thread about one of his projects here: Union Square Thread and it seems like most of the residents are pretty happy with their new homes. Have you spoken with any residents? Urban Planet isn't exactly a representation of all the residents. There's a reason they set up their own private forum and pretty much stopped posting on UP. All I'm saying is BE CAREFUL to anyone who considers buying a place in this project. BE EXTEMELY CAREFUL. I was in Muskegon this weekend and I heard from a good source that the developer has taken deposits on 11 of the units already. That sounds really good in this housing market. If he could convert all of these into sales agreements it seems he'd only need to sell one more unit to get financing for the tower portion of the project. This project is one step closer to reality with the approval of the Ren-zone extension by the state. The Michigan Strategic Fund Board earlier this week approved a nine-year extension of the low-tax zone for the Comerica Bank building. The application from Jonathon Rooks' Parkland Properties of West Michigan was approved by the city in late August. There isn't a single picture of this building here. You can see it in the background of this picture. 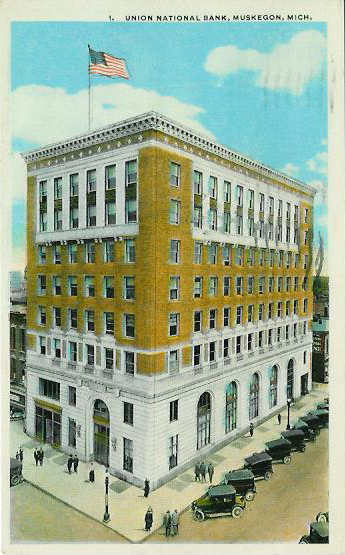 Here is the building in 1925. I really wish they would recreate this facade, but that won't be happening from the plans I've seen. 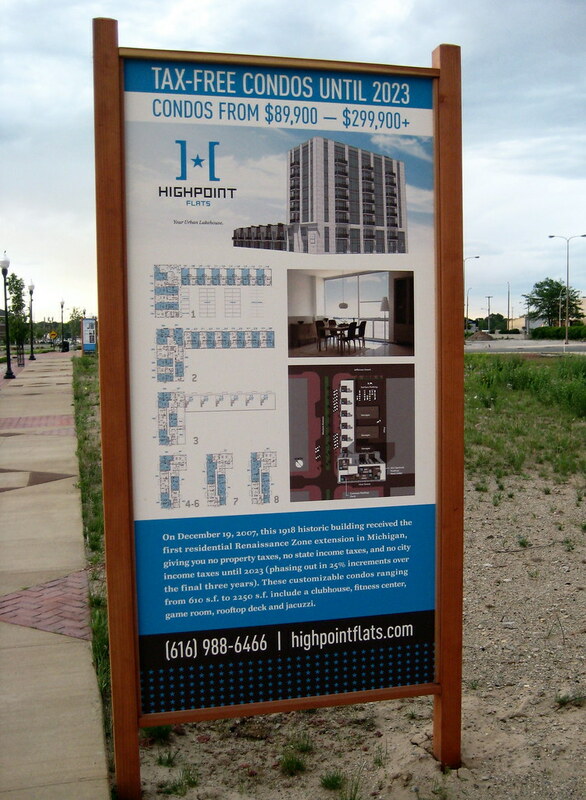 A couple of months ago I acquired a Highpoint Flats brochure. I had meant to take it home and scan it but I kept forgetting to grab it so today I finally just used the scanner at work. You can see it's not a very good quality scan but at least it gives a rendering that can be used for this project until a better one comes along. I wish they'd renovate the building to make it look close to what it did before it was re-clad, but I'm not really surprised to see that won't be happening. Since this will now be a residential building the windows would be expected to be larger then they were in the original building. I'm pretty satisfied with the new plan though. The building will still be white, but have a significant amount of its surface glass. What I find interesting about this plan is they have reduced the amount of commercial and increased the number of condo units since the original announcement was made. The commercial space will only be in the new building addition and not in the original building at all. Along First street will be townhouse type units that will have two floors with separate outside doors for each unit. The Western Avenue facing side will contain the main lobby for the building. I think the units along first street are a good idea since it would probably be hard to lease the space for commercial as long as there are vacant storefronts along Western. I don't agree with the buildings lobby taking up all of the Western side. Corners offer the highest visibility for shops and are therefore are the most valuable location for retail. I'm sure this plan isn't set in stone and this plan is likely already out of date. Thnaks for the info. Unfortunately, they pretty much obliterated the original facade when they put the marble on in the 1960's. Trying to restore it would probably blow the budget. I look forward to seeing the site plans when this comes to the Planning Commission. As far as empty store fronts on Western Ave, every store front available for lease on Western Ave is occupied. The few that are empty are either not available to lease or not finished with their renovations. Sorry, but I'm a little confused as to the proposal's orientation. From where I'm sitting it looks like the condos will be on the ground on the main (planned) commercial corridor of the city. I don't know if that's true. If it is, it seems little odd to have front doors next to shops. I must be mistaken. The plans are tiny, but from what I can tell, the long side of the builfing faces Western and has preobably retail bays in those light blue areas. The white area on the corner might be the main building lobby and then the six units around the corner face whatever the side street is there. So yes, it does appear that there are ground floor units buit they aren't on the "commercial corridor". It also appears that they have only ground level balconies complete with a railing instead of front doors. Even so, I don't know if I'd want my unit to be right on the ground with lots of people walking by at the same level. Well some new marketing signs went up within the last week. They are pretty cool because they show both the site plan and the floor plans. It looks like some additional changes have been made and now the commercial space can be a live/work unit. They have also launched the site for this development: Highpoint Flats Website The site is very professional looking and includes downloadable floor-plans and a 3d fly around of the building.